When you pay for the plan your device will be immediately connected to the internet. But if you for whatever reason disconnect your Wireless network and want to reconnect later, there is no way to make it work, the service just won’t let you log in again. The only way to achieve this is by restarting your device completely (yes, iPhones and iPads included). This also happened even without disconnecting the device from the wireless network but just by turning off your screen and trying to use it again a couple of minutes later, its just impossible to use it again, you have to restart the device. Another big down side of the service is that the plan you purchase is stuck to the device you are actually using. So if you purchased your 24 hour pass on your iPhone your wifi will stick to that device only, you can’t login to your account on your laptop or iPad and use the same internet connection there. The technical reason behind this is that the service is enabled for the MAC address of the device where you did the purchase from. If you want to share your connection through for example, your iPhone’s embedded Hot Spot, so you can use your laptop with the connection you just purchased from your phone, forget it, it won’t work. 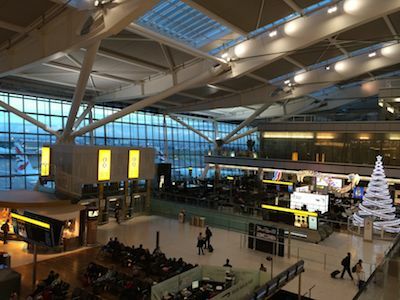 I really feel sorry about the bad experience I had with Wifi at Heathrow, unfortunately, I must say this is not the first time I had issues, when I tried to use Boingo some months ago it was a nightmare. Talking with the support guys at Arqiva, I got to know they are the owners of the infrastructure and Boingo actually uses the same from them. My personal recommendation about how to remain connected would be to use a SIM card that would allow you to place it in a portable mini router (MiFi device) so you can be connected with all your devices. There are some companies that are offering roaming data plans on several countries for a relatively accesible monthly fee. Here at Heathrow airport I found a couple for 30 pounds a month for something like 5 GB of data transfer per cycle with included roaming in up to 40 countries, but I am sure there are other offers that would allow you to achieve the same for less money. If somebody knows and has experience about these type of SIM card offers that would allow you to use Data all over the world or at least on several countries then it would be great if you can share your knowledge / experience with them. I know for US residents T-Mobile recently started offering unlimited roaming plans, and I believe this is the beginning of a great revolution that will benefit us, the users.